When Peter Chan was a child, he figured that the best way to help people would be to become a social worker. As an immigrant from Hong Kong growing up in Canada, Chan witnessed first-hand the challenges faced by people from different ethnic and cultural backgrounds. But it was his fellow undergrads who nudged him toward medicine. For Chan, becoming a doctor instead of a social worker wasn’t so much an abandonment of one aspiration for another, than an integration of goals. As a first-year med student, Chan volunteered with a student group and went to Haiti to do work during the country’s HIV crisis. That experience drove home the importance of education, community health and prevention, as well appreciating the cultural nuances in addressing the very personal and sometimes taboo aspects of healthcare. 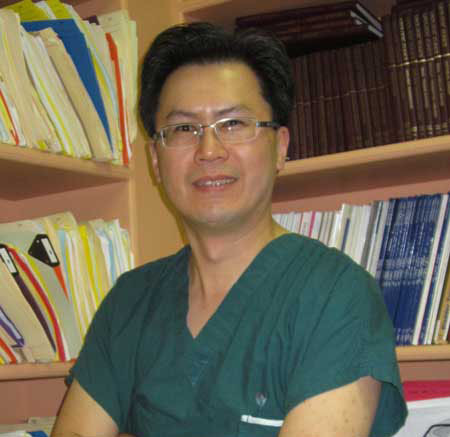 After earning undergraduate, medical and graduate degrees from McGill, Chan pursued concurrent Fellowships in Male Reproductive Medicine and Microsurgery at Cornell University, and Molecular Genetics at Rockefeller University. In 2002, he returned to Montreal and began working at the McGill University Health Centre (MUHC). In the short decade since, his impact has been tremendous. A devoted educator, he not only teaches undergraduate as well as graduate and post-graduate students at McGill, but delivers continuing education workshops on a range of men’s health topics to Quebec family doctors. Chan’s educational reach extends around the world through a course on infertility to attendees of the prestigious American Urological Association annual conference, and in Japan and China where he teaches micro-surgery to fellow doctors. Although all the teaching takes up a lot of personal time and perhaps means seeing fewer patients here, Chan thinks it’s a good trade-off, “I can either treat 100 patients here and that’s it. Or I can treat 10 patients but share my knowledge with 100 doctors who can then go on to treat 100 patients each.” In fact, all combined, Chan teaches at least five times that many doctors each year. Chan still manages to directly help hundreds of Montreal-area patients each year. Recently, he hosted his seventh annual free public men’s health exam. In total, more than 250 men came by Alexis Nihon Plaza that day for a complete health exam, and at least 1,000 people stopped by the various information booths offering information on a range of men’s health issues. Since launching the event in 2006, Chan and his team have examined approximately 1,000 men, half of whom have been contacted to seek follow up exams. The event requires mindboggling logistical planning and hard work. Chan is quick to credit the help and long hours of his indefatigable assistant, Lina Ordonselli. Together, they assemble a volunteer team of over 30 doctors, nurses, researchers, administrative staff and students who share their time and expertise in making the event a huge success. Chan has also been conducting research on the subject of male reproduction going way back to his undergraduate days. More recently, he has been involved as a lead or co-lead on numerous CIHR-funded research projects looking into the broad spectrum of men’s health issues. But it is male fertility preservation for boys and men – particularly for those who are dealing with different kinds of cancer – that has him especially interested. Chan has developed his own CIHR-funded project on a proteomic study that looks at how men’s sperm changes following chemotherapy.